This affordable air purifier is perfect for you or your childs room, can act as a bed night light whilst ensuring the air your child breaths is pure and perfeclty free of Bacteria, Fungi and viruses. Keep the ones you love protected.Great for nurseries, schools and offices, this machines is low on sound and fantastic in killing bacteria nad viruses(SABS tested). Ideal for colds, flu sinus, hayfevers and allergies.Live a healthier life breathe fresh pure air. 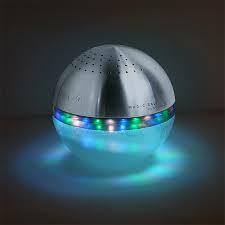 Has 3 changing colored light led.Used with our solutions ;kills bacteria and viruses.Portible,low eneregy. Athsma, sinus and allergies relieved with pure clean crystal air,whilst aromatizing your space leaving you treated with the botanical extract that have millions of benefts, choose now for your desired effect on the human body.Healing with every breath.Light and easy to use anywhere anytime, the best air purification system in the world,only SABS tested solutions in SA. Premium Air Purifier with LED light,color changing lights. Perfect for you, Perfect For your Home, Perfect for your Family!